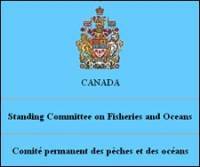 The Chief Executive Officer of the Canadian Coat Guard Auxiliary Harry Strong was invited to appear before the House of Commons Standing Committee on Fisheries and Oceans on October 21, 2003. The Committee began its work in November 2002 and is currently working on a comprehensive study of the Canadian Coast Guard. Its members have been travelling to several European countries in September to learn about different ways of organizing coast guard activities and to review fisheries management practices.